Two of the heavyweight contenders in providing Web Conferencing solutions to the small-to-medium sized business market are GoToMeeting from Citrix and WebEx from Cisco. Both companies set the bar in their respective area of computing yet, in this particular instance, products overlap. We will take a look at each service and then see how the two compare against each other in terms of value, features and performance. As one of the most recognized web conferencing service brands in the market, this Citrix product is part of a software family used to bridge physical locations with virtual sessions via the Internet. This service allows anywhere from a few attendees to hundreds of attendees to join a secure session featuring real time video and audio. A free version is available for up to 3 users with limited options, which we test out below. The real value of the product lies in the paid, "per organizer" subscription service. An "organizer" is someone who can schedule, start and control the meetings. The plans then allow up to a certain number of "attendees" who can join the meeting and interact with the meeting. Paid plans start at $39 per organizer per month (for the annual plan or $49/mo if month-to-month), and up to 25 attendees who can enjoy all the basic options such as screen sharing, HD video and VoIP based audio plus a handful of other features that include limited session recording, mobile support, toll-free options and several other features. For $56 per organizer per month (annual plan, or $69/mo if month-to-month), up to 100 users can participate. Both plans allow for a free trial of 30 days. Options for larger groups are available, though a discussion with a sales representative will be necessary for exact pricing based on your needs. We tested out the free version of GoToMeeting (up to 3 attendees) to get an idea how good the service was. The first stumbling block was that the free version runs only in Firefox or Chrome browsers (Microsoft IE and others are not supported). We used Firefox to perform our tests. Setting up the meeting was fairly straight forward, you just go to the website and click on "get started" under the free plan info and the meeting interface starts up. You need to share a device for video and audio, for example a webcam, to continue. Once you have entered you will see the sharing screen, as shown in Figure 1 below. Functionality is quite limited in the free version and the overall user interface is not as intuitive as it could be. 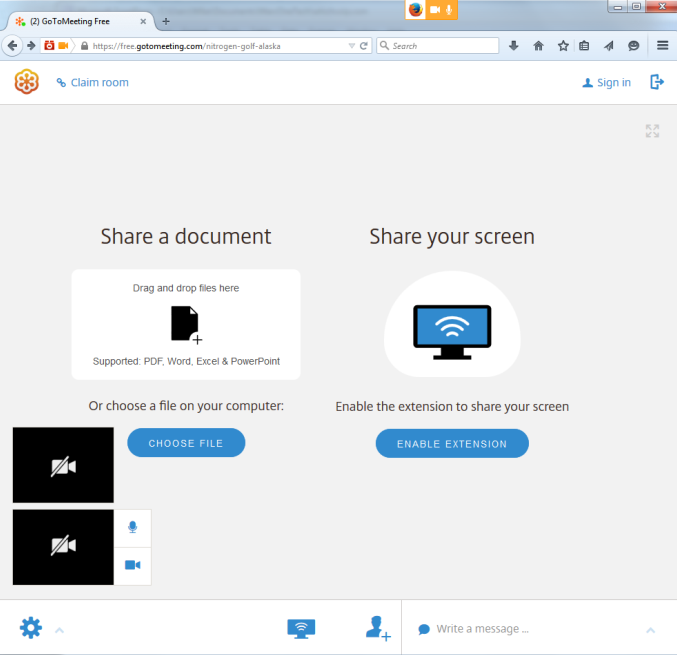 The sharing window allows you to share a file on your computer or to download a browser extension (software) to share your screen. If you selected a webcam or video device before entering the meeting you will see your video feed towards the bottom left side. You can toggle the video on or off by clicking on the blue video icon next to it. Clicking on the blue microphone icon allows you to mute and unmute your microphone. You can invite others by clicking on the blue head icon, near the bottom middle area of the window. 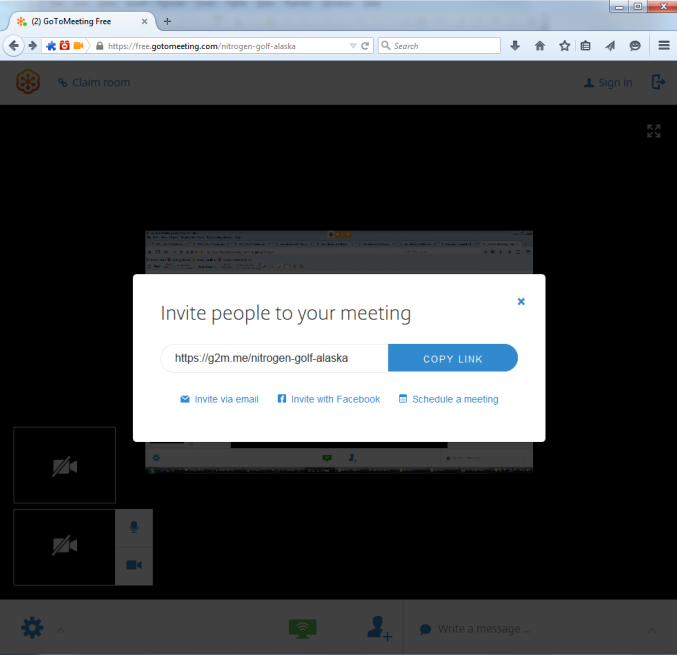 This opens up an overlay window providing a link to the meeting. It can be used to invite others via email or facebook, or you can simply copy the link yourself. A second video feed towards the bottom left will appear once a second attendee has entered the meeting. The video quality is just "OK" and you will need to upgrade to a paid plan to get HD video quality. We found audio to be choppy at times and not always clear. I found myself increasing the volume on my computer to try and better understand the conversation with the other attendee. As well as audio and video, a chat function is available to the bottom right, allowing you to send a direct text message to other attendees in the meeting. There is a "Claim Room" link to the top left which sounds more like something from "The Bachelor" TV show than a web conferencing solution! This link allows you to get a personal meeting room (virtual) by entering your Facebook or GooglePlus login. I did not test this feature. To leave the meeting you simply click on the blue door like icon in the top right. Here are some screenshots of what the free verison of the GoToMeeting user interface looks like, along with some of the functionality. Figure 1 shows the sharing options, after clicking on the blue screen icon towards the middle of the bottom of the browser window. Here you can choose between sharing a file on your computer or downloading a screen share extension for the browser you are using. You can also see the messaging tool to the bottom right side. Simply click inside here and write a message that can then be sent to other attendees. The "Claim Room" link is in the top left corner and allows you to sign into a private virtual room with an attendee. The black block towards the bottom of the left side provides the ability to share your webcam/video device and control audio (mute/unmute). Figure 2 shows the screen for inviting others into your meeting. Click on the blue head icon with the "+" symbol to get this overlay window. There are a few options for inviting others (email and facebook) or you can copy the link. Click the "x" in the top right corner to close this overlay window. Originally, WebEx began as an early contender in the online collaboration market (1996, specifically) before a real market existed for such products. The company was later acquired by Cisco in the latter half of the 2000's. Backed by what many consider the ultimate networking authority, WebEx is one of the most powerful and functional conferencing platforms in the market today. 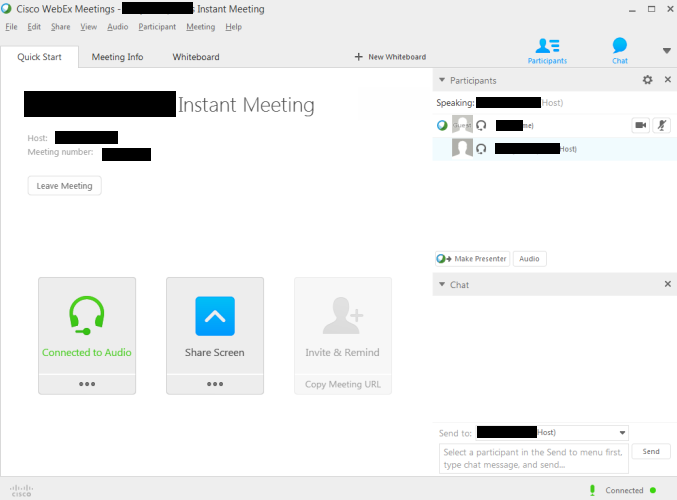 Much like GoToMeeting, a free account is available for conferencing for up to 3 users (see below for our test drive of this option). Licensing for larger groups is available at $39 per month for up to 25 attendees (annual plan or $49/mo if month-to-month) and $69 per month for up to 100 attendees (annual plan or $89/mo if month-to-month). WebEx also have a lower cost plan for up to 8 attendees for $19 per month (annual plan or $24/mo if month-to-month). Businesses requiring groups of more than 100 will need to contact customer service for pricing based on their needs. We tested out the basic free WebEx solution features by performing a meeting between two (2) participants. With no real instruction required the user interface was intuitive and simple to use. Once you have joined the meeting there are three (3) main buttons inside the "Quick Start" window. One for "Connecting to Audio" (VoIP based), one for "Screen Sharing" (only available to the attendee assigned to present or to the Organizer), and one for inviting others to the meeting. On the right hand side you can view the participants list and also access the chat window (for sending messages to all participants or for messaging a specific attendee). In the Participant's list you will see your name that you entered when joining the meeting. Besides your name is the option to share your webcam/video equipment to engage in a true video conferencing meeting, and the option to mute your microphone. Note that you need to be on a paid plan for the HD video capability. A "Whiteboard" session is easy to start by simply clicking on the "+ New Whiteboard" link just above the Participant's list box. This link is only active for the assigned Presenter. Clicking this starts a new "tab" in the main user area. Anyone can use their mouse to "draw" on the whiteboard, or use the text option to add notes. During the meeting, the audio was crystal clear. The assigned Presenter has a tool bar to aid in sharing that is very intuitive and straight forward. The Organizer of the meeting has the ability to record the meeting at the click of a button (via the tool bar). Even with the free version you are assigned a username and password to access the online portal. Inside the portal you can schedule meetings or use the "meet now" option to get meetings set up. You can also access any meeting recordings in the portal. It is also worth noting here that Cisco has released a new, free UC client for the PC, MAC, Android, iOS and Windows phones that may be useful for small businesses that need a basic messaging, VoIP and desktop sharing app that works on all devices. For more information see our Cisco Spark review. Here are some screenshots of what the WebEx user interface looks like, along with some of the functionality. Figure 3 shows a screenshot of the "Start" screen. You can toggle the participants window and chat window (that are on the right hand side) on or off by clicking on the blue icons in the upper right corner. The assigned Presenter or Organizer can share their screen by clicking on the "Share Screen" icon in the middle of the Quick Start area (grayed out if you are not assigned Presenter status, or blue if you have the ability to share). Figure 4 shows the tool bar available to the person sharing (this appears at the top of the sharer's computer screen - this is only visible to the Presenter). The tool bar provides the same functions for both the Organizer or Presenter with one difference. The "Recorder" option (to record the meeting) is only available to the Organizer. 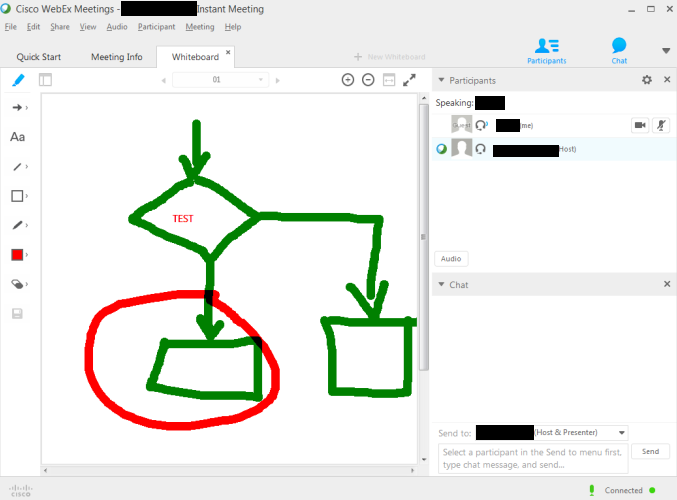 Figure 5 shows the "Whiteboard" function in use (only the Organizer or Presenter can initiate a whiteboard session but all attendees can interact). Each attendee is set a different color for markup (which can be controlled by each attendee individually). Both products are very similar in the sense that each accomplishes the same task. These solutions bring remote users together in the same virtual room, effectively simulating a real physical meeting (from sharing ideas to meeting face-to-face). Quite frankly, pricing is quite similar though the differential in cost begins to wave in the favor of GoToMeeting for larger groups. With that said, the WebEx service offers more powerful tools allowing clarification of more complex issues with features like the virtual whiteboard. It also has the option for a smaller group plan which may be perfect for small businesses (up to 8 attendees). In terms of sheer power, WebEx takes the win. It can be integrated into applications like Microsoft Outlook where meetings will populate in the calendar and may be initiated with just a couple clicks. Other tools are present that GoToMeeting lacks such as effective file sharing (though it is possible with ShareFile) which is very helpful when critical documents must immediately circulate among a team of attendees. Those solving complex problems, whether network architecture provisioning, a supply chain problem or other issues that require extensive visuals, the whiteboard feature is a useful tool for visually conveying complicated thought processes. WebEx technology is also part of Cisco's Unified Communication Solutions. GoToMeeting is still a phenomenal product, serving as a very useful tool for most virtual meetings that require some form of screen sharing or collaboration. Unless planning a major project with many complicated layers, a simple virtual webinar meeting will likely suffice as not all ideas require sketches or instant access to documents not shared during previous interactions. Both are very easy to use, for organizers and participants alike. Users unable to sit in front of a computer have the ability to use an application for either platform on a mobile device. Both offer secure meeting rooms so plans to conquer the world are unlikely to fall victim to a "man in the middle" attack. Both the above options are great for serious business sessions. However, not everyone needs the tools included with these Conferencing clients. Other alternatives exist, many of which can be cheaper and powerful enough to emulate the feeling of a real conference room. Arguably, one of the best free options on the market is the free service from ooVoo. This application allows up to a 12-way video chat, screen sharing capabilities and users can even record sessions. Another great option is join.me by LogMeIn. A user simply downloads the application from the official website, starts a session and sends a 9 digit code to the other participants for an intuitive screen sharing session. It is a great tool for remote troubleshooting when not using an RDP session. FreeConferenceCall.com is another provider that is enjoying growth in this market. It is difficult to declare an outright winner between GoToMeeting and WebEx. Both are great tools and offer a similar pricing structure, though GoToMeeting is a little less expensive for higher attendee numbers and WebEx offers a lower cost plan for smaller groups. Truly, it boils down to preference and the desire for convenience. WebEx is more powerful with better sharing options, a more functional whiteboard component and other capabilities such as breakaway sessions. GoToMeeting is a great product, appealing to those looking for the best deal in terms of price. Though both solutions are easy to use, WebEx feels simpler to use. Possibly an important selling point for those using the platform to connect groups less technically inclined. Those seeking more power should look into WebEx while those seeking a simpler web conferencing solution may be happiest with GoToMeeting. If you are only considering the free versions (for up to 3 attendees) then for me the WebEx solution was the clear winner due to its clearer audio, intuitive interface, and greater functionality. Use our comment form below to let us know which solution you decide to go with and why, or to simply ask a question. While comparing conferencing providers like Webex and Gotomeeting you may also be considering your existing phone service solution. Here are some popular providers to compare with your existing service.